Today, many applications can be used with native desktop operating systems accompanied with mobile optimized applications and web browser based clients. 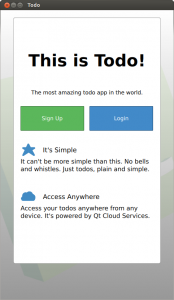 Qt Cloud Services makes it possible for you to develop such applications with ease. Start developing modern, cross-platform and connected applications that will work on any device with this tutorial! The backbone of any connected application is the server-side application and logic which is used by client software implementations. This tutorial will demonstrate development of server-side application running on Qt Cloud Services that can be connected from Qt and HTML5 clients. 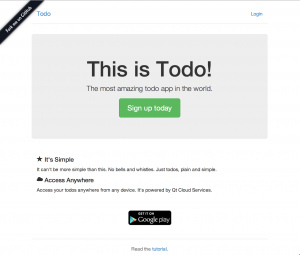 You can see the final application running at our Managed Application Runtime service http://qtc-tutorial-todo.qtcloudapp.com. Managed Application Runtime is a cloud-based runtime environment for developing, running and scaling server-side applications. It supports supports some of the most popular runtime environments including Qt/C++ and Node.js. It is currently available as Early Access technology for selected developers. Qt Cloud Services is available to all Qt users, regardless of the license or version. If you haven’t started with Qt Cloud Services already, please sign-up for free at Qt Cloud Services website. See the complete tutorial for this project. Happy programming! I like Node, but it should be considered an embarrassment that you have to use Node. We should be able to make REST services using Qt and QObjects. Imagine defining a QObject-derived class with slots, which provide properties and automatic serialization there of, to JSON. Then we take these objects and link them together as child objects to construct a path. (Where JsonResponse is a class with a QJsonDocument and a Map of http header values for the http response.